With the iOS 11.3 preview earlier today, Apple announced the rollout of an iMessage feature that would allow customers to speak directly with businesses. Apple Business Chat was announced last year at the company’s Worldwide Developer Conference, and will launch this spring with iOS 11.3. 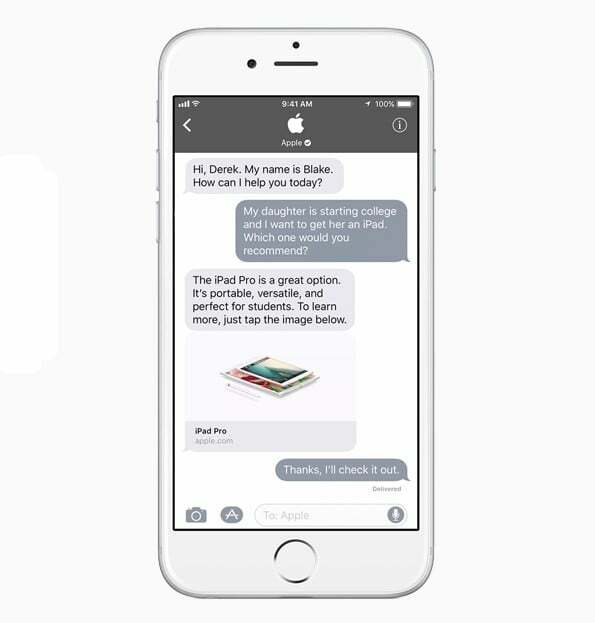 While iMessage has traditionally been designed as an improvement on basic SMS between iPhone users, this move towards Apple Business Chat allows a unique form of B2C communication that should make it easier for businesses to communicate and support iPhone users. Android remains king as far as widespread adoption goes, but Apple still represents a significant portion of the smartphone market – at least in the West. Having the option to communicate with businesses the same as they would a normal contact through Apple Business Chat gives iOS users a unique advantage over their stock Android counterparts. Apple Business Chat is Apple’s first foray into this type of communication, but there are a number of apps that already offer the same functionality. Cross-platform options already exist, such as that from Facebook Messenger, Google, and Twitter, and WhatsApp recently launched their own WhatsApp Business app for Android. Apple Business Chat is coming into a market that’s already saturated by options, but considering the seamless integration with iMessage, they may have a fighting chance when it comes to communication between businesses and customers. It may seem a little strange to talk to businesses through a form of communication previously thought of as limited to friends and family, but Apple Business Chat is a natural transition that improves on existing technology and offers iPhone users new features that may make the iMessage platform even more of a one-stop-shop for their communication needs. Apple Business Chat is also another feature to make the upgrade to iOS 11.3 seem a little more attractive, though the chat may play back seat to the upcoming changes that allow users of older iPhones to turn off performance throttling. Techcrunch reports that the majority of consumers would rather message a business than call customer service, according to a Facebook-commissioned study by Nielsen that released last fall. Apple Business Chat gives them yet another option to communicate in a B2C world that is quickly changing as technology advances. Having the ability to get answers quickly and efficiently without sitting around on hold may help businesses support their customers and resolve some of the headache involved with getting service on the customer’s end. It remains to be seen whether Apple Business Chat will manage to carve out a piece of the B2C market for itself, and there’s certainly some stiff competition from businesses like Facebook and WhatsApp. The success of the platform will largely depend on adoption from businesses. There definitely seems to be some potential here with Apple Business Chat – we’ll just have to wait and see whether the company can capitalize on it.